If your Check Engine, ABS or Air Bag light is on, don’t hesitate to bring your vehicle to Overdrive Auto and have one of our technicians quickly evaluate the problem and provide an honest estimate for repairs. A vehicle’s engine control unit has access to a variety of devices in the car’”and this can often be taken for granted. An engine control unit will check the airbag, turning signals and other courtesy lights for consistency and functionality as well as monitor the temperature of your oil and other important readouts of the vehicle. Newer and more sophisticated vehicles may have up to 80 functions of the engine control unit. 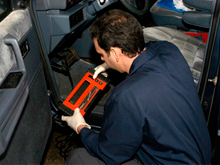 Every car has many functioning computers and as such, it may require a few diagnostic runs of this process to be able to catch everything. Fuel Mixture ‘“ Fuel-injected vehicles have a carefully measured level of fuel and oxygen required for combustion. Without the proper fuel mixture, your car’s average fuel economy may be suffering, and your car may be running too hot or too cold. Ignition Timing ‘“ This basically ensures that your spark plugs are firing at the correct time. Engine misfire is caused by the misfiring of spark plugs, which can lead to a knocking or pinging sound in your engine. Idle Speed ‘“ This is a measurement of your engine’s Revolutions Per Minute (RPM) while at rest. If your car is equipped with a Full Authority Throttle Control, cruise control and top speed limitations are also controlled by the same system. Variable Valve Timing ‘“ Some vehicles are equipped with certain valves that need to open and close at a specific time in the engine cycle. This will ensure the optimum economy and power of your engine. Water Temperature Correction ‘“ When your engine is still cold, this will add just a bit more fuel into the engine and warm it up a little faster so your car can get to normal operating temperature. Fuel Pressure Modifier ‘“ This increases the fuel injection fire time if your fuel pressure is abnormally low. For any issues or problems regarding car misfire, engine misfire, and car tune up, let the professionals at Overdrive Auto take care of it. A trusty auto mechanic shop can help guarantee safety for you and your passengers.